UFC submissions it is what makes the UFC so popular. While many people love to look at the spectacular knockouts common with mixed martial arts fighting, true aficionados of the sport truly enjoy anticipating a submission ending the bout. Submissions in mixed martial art derive from Brazilian jiu jitsu, judo, submission wrestling, and other grappling arts. Whether from a top pinning position or from the control of the guard, the straight arm bar remains one of the very best submission locks that you can employ in the course of a bout. Bending and twisting locks from the top position are probably even higher percentage finishes than the straight locks. This is because of the greater ability to pin an opponent from the top with bent locks than with straight ones. However, bent arm locks from the bottom rarely work since the ability to maintain proper leverage can be considered limited. This is probably one of the most frightening leglock to be caught with since it twists the knee and ankle. This is achieved by using your legs to keep the opponents knee locked in place and your arm hooks around the opponent's heel and twists it far beyond its natural range of motion. Also, the potential for injuries - severe injuries at that - are high as the nerves in the knee are dense and do not reflect pain quickly. As such, injuries can occur without warning. This submission is identical to an arm bar with the obvious difference being the stress is placed on hyperextending the knee as opposed to the elbow. As with the heel hook, the submission can come with a strong injury risk. Previously called a front facelock in wrestling, the guillotine choke cuts off the flow of blood to the brain while also cranking the ligaments in the neck. This leads to a relatively quick submission if not defended against quickly and effectively. What makes this particular submission unique is that it can be performed from any position. This includes both the ground and when standing. Because of the sheer totality of positions in which the guillotine can be applied, it is a submission that one always need to be on the lookout for. This is a devastating carotid artery choke that has felled scores of fighters over the past 15 years. As such, it can be considered one of the highest percentage submissions in the game. Triangle Choke: Royce Gracie made this old judo submission famous way back in UFC III and it still remains one of the top submissions to this very day. There is good reason for this: it is easy to apply and extremely tough to get out of! And yes, there will be submissions that just do not effectively make the transition to the octagon. The twisting ankle lock/toe hold is very difficult to perform due to the fact that fight gloves just flat out get in the way of performing the submission. Pain tolerance can make the Achilles lock, calf crush, and bicep slicer to difficult to execute. Some neck cranks definitely work but they have been banned in competition which makes then unworkable by default. Bone locks such as shin and forearm locks are just too difficult to pull off although they are commonly tried with little luck. And, basically, any flashy move that required coordinating a number of steps is best avoided when fighting in MMA since the extra steps makes pulling off the submissions a little tough. 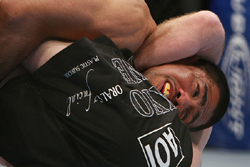 Top fighters such as Frank Mir, BJ Penn, Demian Maia, and others have made a name for themselves with submission holds which is why they are famous names. Really, if you can win fights with a submission, fans will take immediate notice! UFC submissions can make your famous. Properly training submissions entails learning them in isolation against and non-resisting opponent. Then, you can gradually increase resistance levels to improve timing. Afterwards, seeking to apply them in full, all out sparring will help develop submissions skills to the highest level possible.